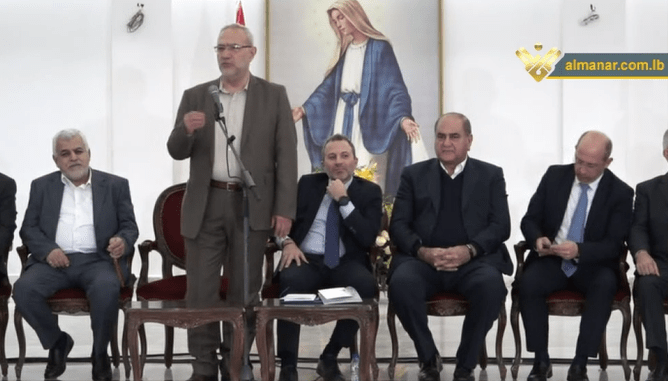 Hezbollah and the Free Patriotic Movement on Tuesday marked at St. Michael Church the Memorandum of Understanding they concluded in 2006, stressing the importance of sustaining the agreement. Hezbollah representative minister Mahmoud Komati said that the Memorandum of Understanding between the two sides would remain because it is based on honesty and loyalty, adding that it helps solving the main problems hindering the progress of the nation. Komati stressed that the Understanding does not deny each party’s right to have a distinct identity, adding that other parties are invited to join the agreement in order to reinforce the national unity. Head of the Free Patriotic Movement Minister Gebran Bassil said that the Understanding must be reinforced by setting the national balance, pointing out that having different attitudes towards certain domestic issues must not lead to major disputes. “Had not Hezbollah been there, General Michel Aoun would not have become a President; had not the Free Patriotic Movement been there, Hezbollah would not have been able to defeat ‘Israel’ and the terrorist groups,” Bassil said.